What’s closed in the Boston area for the Day Without Immigrants protests? A sign on the door to Modelo’s Market Cafe in Somerville. The market is closed as part of the Day Without Immigrants protest. Today, immigrants, their advocates, and allies around the country are protesting the Trump administration’s recent executive orders calling for “extreme vetting” of immigrants and a recent crackdown on “illegal immigration,” as well as Trump’s commitment to building a wall along the US-Mexican border. Those in Boston are no exception. The protests — called the Day Without Immigrants — are meant to highlight the role that immigrants play in the US economy and the daily lives of American citizens. 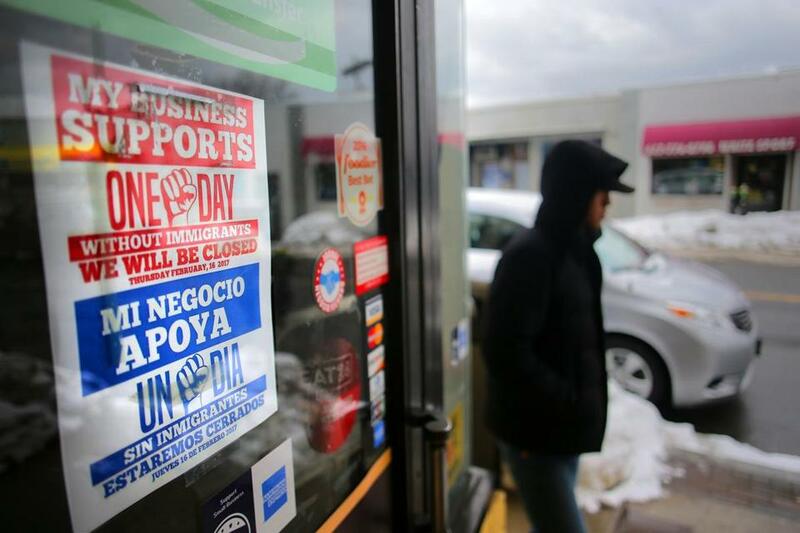 The boycott calls for immigrants to not attend work and school, or spend money. The food service industry in particular employs a great number of immigrants. Thus, there are several restaurants in the Boston area that are closed altogether today, and others that are noting that there will be delays or reductions in service. For example, Cambridge Brewing Co., while remaining open, will be one of those restaurants working with a significantly downsized menu. For Biplaw Rai, a Nepalese immigrant and the owner of Dudley Cafe in Roxbury, today serves as an opportunity to address some misconceptions about the immigrant community. Here is a look at what is currently closed. Anna’s Taqueria — some locations will be open intermittently throughout the day. The Newton restaurant and at least one of the Brookline locations were open this morning. Shojo and BLR by Shojo will be closed tomorrow, February 16th, to participate in the Day Without Immigrants Strike. We are choosing to participate in solidarity with all immigrants as a reflection of our resolute belief in diversity . . The beauty of our location in Chinatown is its deep rooted history in migration, opportunity, and innovation. Our restaurant?s heart and soul are no exception. We hope you understand our choice to commit to this movement . @shojoboston and @blr_by_shojo will resume lunch and dinner service Friday, February 17th. We are open tonight! Miranda Bread in Stoughton posted that it will be closed on Thursday for the protest. N�s do Oliveiras Everett estaremos fechados amanh�. Apoiaremos o movimento ?Um Dia Sem Imigrante". Tendo por objetivo mostrar que o pa�s ter� grandes problemas se o presidente continuar com esta ideia de persegui��o aos imigrantes, estes que em sua maioria v�m aos Estados Unidos para trabalhar e proporcionar uma vida melhor a si mesmo e a sua fam�lia! Ent�o vamos apoiar o movimento e mostrar a for�a que temos! Barbara Lynch Gruppo: No. 9 Park, Menton, B&G Oysters, Sportello, Drink, The Butcher Shop, Stir. Owner Barbara Lynch made a statement on Twitter. We are proud to support our staff members and colleagues who have chosen to participate in today's #DayWithoutImmigrants strike. We are OPEN, but will be offering only baked goods, drinks (coffee, tea, frappes, beer, wine & cocktails) and SOUP! Thanks for understanding. We are stronger together! Lexi Peery can be reached at lexi.peery@globe.com. Follow her on Twitter @LexiFP. Alex Frandsen can be reached at alexander.frandsen@globe.com.